Despite their small size, mice produce enough waste to rapidly make a habitat odorous. 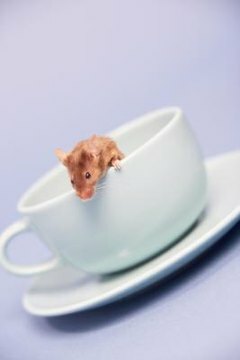 Because they are social, mice do best in pairs or small groups, which of course means more feces and, crucially, urine, the primary cause of smells from mouse waste. A well-kept mouse cage should not have a particularly strong smell. A faint animal odor is inevitable with any mammal. If the smell is getting unpleasant, it's time to adopt a new routine. Replace the cage with a bigger one. More space means more room for bedding, and more bedding material will absorb more urine and its smell. Your mice, of course, will appreciate the extra space. A rat cage might be suitable if all your mice are mature, as long as the bars of the cage are set closely enough together that the mice cannot poke their heads through. Remove soiled bedding every day, or twice a day if necessary, using plastic tongs or a scoop. The mice may be using one area of the cage as the toilet, which makes this task straightforward. If not, just remove any bedding that has become damp with urine. Feces don’t matter so much for daily cleaning. Provide a hamster or rat litter tray. It is sometimes possible to toilet-train mice, at least partially. Clip the tray in the corner of the cage they appear to most frequently use as a toilet and add some heavily soiled bedding over a substrate of a different texture. Clean the tray daily, replacing only some of the soiled litter each time. It isn’t guaranteed that the mice will make all their messes in the tray, but it might help with day-to-day cleaning. Leaving a bit in the tray reminds the hamsters where they do their business after you've cleaned it. Clean the cage completely once a week if it is a large one or twice if it is relatively small. Transfer the mice to a pet carrier or the old small cage if you have upgraded. Dispose of used bedding and cardboard toys or boxes, all of which are suitable for home composting if you have a garden. Wash the cage, bowls and plastic toys with warm water and dish-washing liquid. Dry the cage thoroughly with paper towels, add fresh bedding, and place new cardboard accessories and all the permanent ones inside. Replace the mice.  If the mice are new, retain a little of the used bedding each time you clean out the cage for the first few weeks. The familiar smells will make them feel more secure in what is a completely revamped home.  Male mice produce stronger smells than females, something to bear in mind before adopting new pets. Neutering is not really an option, because the risks are so high for animals this small. ⚠ Never use cedar or pine shavings for mice or any other sort of small rodent. These shavings are dangerous. The same goes for any type of scented material -- replace the bedding more often if the smell becomes unpleasant rather than try to cover it up.